Zoroastro – whom Handel’s anonymous librettist loosely modelled on the Persian sage Zoroaster – is the voice of reason in this opera of insanity and unruly passions. From his commanding opening aria ‘Lascia amor’ onwards, Zoroastro attempts to persuade the unstable hero Orlando to give up his unreciprocated passion for Angelica and return to deeds of valour. Being a wise magician, he eventually succeeds, and in Act III expresses his joy in one of the most jubilantly virtuoso arias in the bass repertory, ‘Sorge infausta’. Inspired by Handel, Mozart created his own Zoroaster-inspired sage in Sarastro (Die Zauberflöte/The Magic Flute), whose arias ‘O Isis und Osiris’ and ‘In diesen heil’gen Hallen’ are among opera’s noblest. The bullying harem-keeper Osmin is altogether different: his blustering aria ‘Solche hergelauf’ne Laffen’ and drunken duet ‘Vivat Bacchus!’ (both using ‘Turkish’ percussion), his futile attempts to control the spirited character Blonde and his bravura Act III rondo ‘O, wie will ich triumphieren’ (which is a must-hear due to its use of one of the lowest notes in the bass register) make him one of opera’s greatest comic villains. Méphistophélès’s charm, wit, and chocolate-rich bass voice – shown to best advantage in such episodes as his demure Act I entrance, zestful Act II aria ‘Le veau d’or’ and dapper seduction of Marthe Schwertlein in the Act III quartet – give him a demonic appeal. His underlying viciousness comes to the fore in his sardonic Act IV serenade to Marguerite and in the terrifying Act V trio – but this doesn’t stop us feeling that in Faust the devil has the best tunes! Philip II’s evolution from authoritarian ruler to suffering husband makes him perhaps Don Carlo’s most interesting character. Until the end of Act III we are inclined to dislike Philip for his tyrannical behaviour towards his wife and son. However, in his aria ‘Ella giammai m’amò!’, with its haunting introduction for solo cello, Philip laments his loneliness and his loveless marriage with a dignity, sorrow and resignation that arouse our sympathies, and that the bass voice’s rich, dark timbre makes all the more poignant. Wagner uses the sonorous richness of the bass voice to convey the wisdom and benign nature of the veteran Grail Knight Gurnemanz. This part requires tremendous stamina – Gurnemanz is on stage for the whole of the two-hour Act I and 90-minute Act III, and has several lengthy monologues. But the beauty of his music, particularly the sublime ‘Good Friday’ monologue, makes the effort more than worthwhile. Strauss pulls off a near-impossible feat in his first great comedy, and creates a character who is as appealing as he is comically repellent. Ochs’s loutish entrance in Act I, boorish behaviour towards Sophie in Act II and sleazy seduction scene in Act III make us thoroughly glad when he gets his comeuppance. And yet, his warm bass voice, exuberance and the lilt of his favourite waltz in Act II give him a certain charm. Bartók offers an unconventional reading of the Bluebeard story, presenting Bluebeard not as a murdering psychopath, but as a fiercely private man, who appears to love his new wife Judith but hesitates to reveal his secrets to her. Bluebeard’s mysterious vocal style – predominantly plain declamation, but with passages of tender lyricism, particularly in the heartrending final scene – makes him one of opera’s most fascinating enigmas. It is up to each singer of the role to decide how villainous, or how noble, he might be. There’s no doubting the villainy of Boris Ismailov, who scolds his daughter-in-law Katerina in growling tirades, dreams of seducing her to the sounds of a sleazy waltz, brutally attacks her lover Sergey and terrifyingly returns after his death to haunt Katerina. And yet, one can’t wholly despise Boris Ismailov. As John Tomlinson, one of the role’s greatest interpreters, has remarked: ‘Boris… is completely unredeemable…  but there’s something admirable about the sheer energy of the guy’. Claggart is another great bass villain – the low, hollow sound of his voice make his mixture of brutality and Machiavellian cunning particularly terrifying. He’s not one-dimensionally evil though: his great Act I monologue ‘O beauty, handsomeness, goodness’ – which Britten’s librettist E.M. Forster considered the most ‘important piece of writing’ in the libretto – conveys emotional confusion and loneliness as well as a nihilistic compulsion to destroy what is good. Schoenberg movingly portrays Moses’s inarticulacy by writing his part entirely in growling, halting Sprechstimme (half-song, half-speech), while casting his articulate but untrustworthy brother Aron as a mellifluous lyric tenor. But the dramatic intensity and psychological complexity of Moses’s part more than compensates for its limited melodic content, particularly in the final soliloquy, which ends with the heart-breaking words ‘O Wort, du Wort, das mir fehlt!’ (O Word, you Word that I lack!). Excellent list. I would add Leporello from Don Giovanni and Boris from Boris Godunov. In Don Carlo the description and video clip do not fit. The Grand Inquisitor is Eric Halfvarson, and Ferruccio Fulanetto is Phillip II. I like Prince Gremin's bass aria in Eugene Onegin. Many thanks for flagging this error, which has now been corrected (you might need to reload the page in order to see the correction come through). 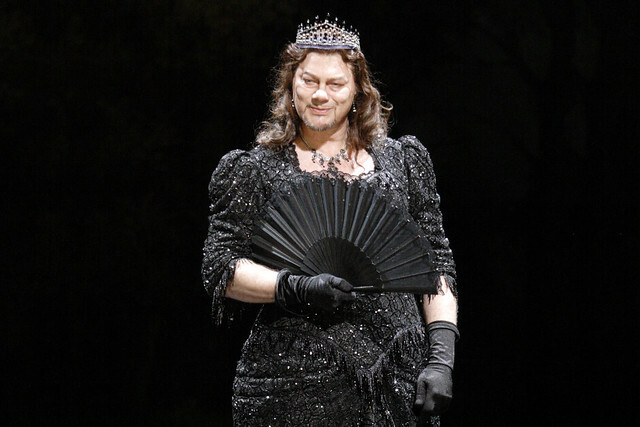 By the way- these are great articles: 10 of operas greatest ( ) roles. I still get confused about the range of the different voices, then it seems there are many subgroups also (lyric/dramatic soprano. Baritone/bass-baritone/ bass). More explanatory articles please! Do all voices become deeper as one ages? Please correct René Pape, not Papa. This is an automatic correction, everybody in the world struggles with it. The Cook from The Love of Three Oranges by Prokofiev - the opposite to a trouser role! The Christoff video is now unavailable. We seem to miss the great bass parts written by Mussorgsky (Boris, Pimen, Varlaam, Rangoni (can also be a baritone), Dosifei, Ivan Khovanski, Shaklovich) - and what about Massenet's Don Quichotte? And Mefistofele by Boito? Or (unless they are considered baritone roles) the villains in Tales of Hoffmann? I understand that you had to limit yourself but leaving out Mussorgsky totally?